1. Anti-semitism exists because the gentiles naturally envy the Jews’ exemption from the rule that all tribes eventually die out. 2. Christianity prevailed because its message of universal salvation assuaged the gentiles’ fear of tribal extinction. 3. Christianity needs the Jews, because they stand as a living proof of divine favor; without that proof, Christianity could not offer the gentiles any hope of immortality. 4. When Christianity recedes, the gentiles’ Jew-hatred returns, often with calamitous results (e.g., the holocaust). 5. Europe is literally dying—that is, failing to go through the trouble of reproducing—because both ethnocentricism and Christianity have been discredited, which leaves Eurpeans nothing but to accept the ultimate fate of all gentile tribes (i.e., extinction). 6. Islam is a cover for pure racism and barbarism, against which Judaism and Christianity are necessarily at war. The Spenglerian theses are on one level wonderfully explanatory. Europaean population decline, American pre-eminence, Muslim fanaticism, the “new” Anti-Semitism, even the current economic depression all fit into Goldman’s theories. As his pseudonym suggests, Goldman accounts for pretty much every past development as well, from the triumph of Christianity to the rise of nationalism. The whole performance can be quite diverting. At the same, it’s hard not to suspect that Goldman is peddling moonshine. I herd my wife and kids to church on Sundays, sit through the sermon and find an excuse to skip coffee hour all because .... I am rebelling against the “incurable necrosis” of the Anglo-Saxons? So far in my introspections I haven’t uncovered evidence of that. Nor do I know many Christians of whom it can plausibly be said that deep in their souls they are seeking some simulacrum of Jewish survival. Further, while individuals fear death in a fairly straightforward way, only in a metaphorical sense does fear of death grip whole peoples. Back to Rosenzweig. As noted, Goldman does not claim originality, but says that most of his ideas come from Rosenzweig, to whom Spengler pays frequent, almost fulsome tribute. Just how profound was this man Rosenzweig? 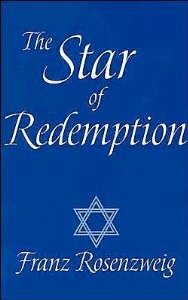 I picked up a copy of his magnum opus, The Star of Redemption, to find out (or, to be precise, the William Hallo translation that Goldman recommends). It is immediately apparent that Rosenzweig does not practice what in some English-speaking philosophy departments is churlishly called “real” philosophy. Briefly, there are two contrasting styles of doing philosophy. One—called “analytic” and generally carried out in English—values precision, clarity, and valid argument. The other—called “continental” and generally carried out in French or German—values charisma and oracular utterance. Not surprisingly, continental philosophy thrives mostly in English departments, while analytic philosophy self-consciously subordinates itself to the physical sciences and mathematics. The distinction doesn’t fit all cases—Nietzsche, a continental, could be quite rigorous, while Wittgenstein, an analytic, was notoriously obscure—but still holds up fairly well. If you seek understanding, you read the analytics; if it’s prophecy you’re looking for, you read the continentals. Two paths lead from the Nought to the Aught—or, more precisely from the Nought to what is not Nought, for we seek no Aught—the path of affirmation and the path of negation. The affirmation is the affirmation of the demonstrandum, the non-Nought; the negation is the negation of the given, the Nought...Like every affirmation through negation, affirmation of the non-Nought points to something infinite; negation of the Nought, like every negation, points to something limited, finite, definite. Accordingly, we behold the Aught in twofold guise and in twofold relationships to the Nought. Und so weiter. Can we now derive proofs about divine freedom using the symbol “A=”? Writing of this kind has its defenders, who take pains to extract something from it that is both intelligible and reasonably compelling. Myself, I plead philistine indifference. I consider only the political implications of Star, of which, surprisingly enough, I find very few. The Spenglerian theses in particular seem more like a creative gloss or “misprision” of Rosenzweig than an accurate restatement of his views. For all Spengler’s obeisance to Rosenzweig, I suspect that Goldman came up with his stuff on his own. To be sure, one can certainly find the passages that inspired Spengler. The Jews, writes Rosenzweig, are the “eternal people” or simply “the people,” as opposed to other peoples, who are only “the peoples of the earth.” Jews are a pure “blood community,” while other peoples “sink their roots into the night of earth,” that is, they identify with a specific piece of land, from which they must ultimately be expelled. The gentile peoples, unlike the “eternal people,” believe that “death [that is, tribal death, as opposed to individual death], even although it be at a very distant juncture, must come eventually.” Gentiles have suffered “inner conflict ever since Christianity with its super-national power came upon them.” The Christian church counterattacked “the pagan idea [surviving] in the form of memory,” but eventually Christian unity was “sundered at every point” by “pagan figures come back to life,” including in the form of “nations” and “states.” The gentiles’ various secular states, which “emerged as rebels” against the Church, created a “sham” sense of eternity. To reestablish a unified Christianity, the church needs the Jews as an actual and not merely “idealized” promise of immortality. Jew-hatred for the Christian is then really self-hatred. Isolating these passages—scattered across the last 150 pages—in this way gives a very misleading picture of Star. Unlike Spengler, Rosenzweig does not seem particularly interested in the rise and fall of peoples. Rosenzweig apparently wrote Star on postcards while serving in the German army in WWI. It shows, for the book consists of several hundred more-or-less independent meditations, each coming under a separate rubric (“Love,” “China,” “Miracle,” Shame, “Commandment and Freedom” “The Oecumene,” “The Grammar of Eros”) and each just a few hundred words each. Rosenzweig finally arranged his meditations in three parts of three books each, so that the whole book resembles the overlapping triangles of the eponymous Star of David. About a dozen of Rosenzweig’s meditations could be turned into gripping underground-style pamphlet proving that all history consists of the rise and fall of tribes striving to match the survival of the Jews. That is essentially what Spengler has done in his columns. But the pamphlet wouldn’t be Rosenzweig. Of the hundreds of meditations in Star, few have anything to do with geopolitics. The range of topics is encyclopedic. Here a history of how miracle reports were turned from a proof to an embarrassment for religion; here is a critique of the modernist Protestant theologian Friedrich Schleiermacher; here an analogy between art and revelation; here is a defense of Goethe’s claim to be the only Christian of his age. At the same time, the point of Star isn’t hard to discern: The world can’t be adequately comprehended à la Hegel in a single philosophical system; on the contrary, one needs revelation; specifically, Jews need Judaism and the gentiles need Christianity. Rather like Pascal’s Pensees or Wittgenstein’s Philosophical Investigations, the argument of Star emerges from the fragments. In short, Rosenzweig wants to vindicate orthodox Jewish and Catholic religions against German idealistic philosophy. While Spengler broadly equates “paganism” with tribalism, but Rosenzweig’s understanding of “paganism” is even broader. In Star, Rosenzweig is apt to call “pagan” anything that threatens Christainity unity, including not just tribes and nations (Spengler’s hobbyhorses) but states, artists, and individualists. Spengler takes the meditations on the “peoples of the world” as more or less literal interpretations of history, but they are probably best understood as illustrations of how religion, says Rosenzweig, captures some things that Hegel can’t. Spengler’s discussion of Rosenzweig’s distinction between “Petrine,” “Pauline” and “Johannine” Christianity similarly misses the point. Spengler takes these as literal references to Catholicism (the church of Peter), Protestantism (the church of Paul), and Orthodoxy (the church of John). As Rosenzweig uses these terms, however, they have only rough temporal and geographic correspondences. They can refer to Catholic, Protestant and Orthodox or South, North and East, but also to works, faith and hope or Christianity conquering the world, struggling against disunity, and finally achieving redemption. The Petrine/Pauline/Johannine distinction doesn’t explain history but rather illustrates moments in the Christian life. As the title of the book might suggest, Rosenzweig is talking more about redemption than actual events. In the end, even to the casual reader it is clear that Rosenzweig was not, as Spengler contends, the major thinker of the 20th century. In Star, he wrote an apology for religion directed almost exclusively at the philosophical school that (somewhat regrettably) he took to be dominant—Hegelianism. Rosenzweig certainly makes interesting reading, and Star is full of arresting passages, but one can just as certainly get by without him.